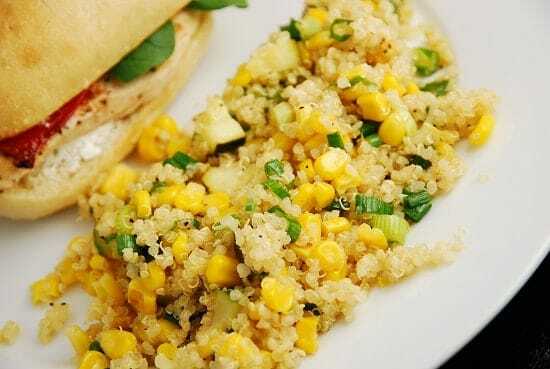 Here’s another incredibly delicious way to prepare quinoa…in this Quinoa, Zucchini and Corn salad in Lemon Butter sauce. Delicately sweetened with a bit of honey, this is one savory and delicious Weight Watchers quinoa recipe that will have you drooling. Each serving is just 3 Points, and it’s loaded with good for you ingredients. High in fiber, and bulked up with fresh vegetables, this low calorie dish really helps to fill you up. Make it as a side for sandwiches or soup, or even serve it alone, on top of some fresh greens – it would make the perfect vegetarian lunch! Enjoy. A delicious quinoa recipe that is savory and satisfying! The lemon, butter and honey add a wonderful and unique flavor to this salad, while the vegetables give it some added bulk, fiber and crunch. It makes a lovely side to a wide variety of meals. Cook quinoa according to package directions. Once quinoa has been cooked, place in a large bowl and set aside. Place a medium sized skillet over medium high heat, melt butter in it, and then add in zucchini and garlic Cook until zucchini is tender, about 3-5 minutes. Then add in corn and honey cook until heated through. Now add the corn/zucchini to the quinoa, along with the scallions and lemon juice and toss to combine. Season with salt and pepper. Made this last night, the hubby and I loved it. I used fresh corn, cut off the cob. Didn’t have any scallions, so nixed those and didn’t add the lemon juice. Loved the taste without and didn’t want to risk not liking if added. Thanks for sharing! Tried this tonight and the whole house loved it! My wife was leery of the quinoa and I was leery of the zucchini… It was great all around. I’m a “whole grain guy” so i’d been looking for a side dish for the quinoa. Thanks! I just discovered quinoa and love it. Looking for recipes to use it in. Thank you! Made this tonight. So yummy! Even my picky daughter ate it and she hates zucchini. Definately a keeper.